Begin by laying your parts and pieces as shown. First, click the two plastic brackets into place. Next, attach the 2 sides. Then, lay the sorter on its side and use the pushpins to lock the back into place. Finally, screw the bottom into place. With the frame complete, begin adding the steel clips. This can be done with the sorter laying down or standing upright. Then, add the short trim strips to the corrugated pieces. Bend the shelving slightly to put the corrugated shelving into place. Now, add the corrugated dividers. To begin putting the final pieces of plastic trim on, first use your fingers or a pair of pliers to flatten the edges of the corrugated shelving. The Safco Value sorter is both fast and easy to assemble. Check out the process here, and get your sorter up and ready for use in minutes! Keep assignments, spec sheets, paper work, and other literature easily organized with a Safco value sorter. This unit is available in 24, 36, and 72 compartment models to ensure that there's a solution to best suit your needs. Adding moisture to your recipe ensures that whatever you're cooking stays moist and juicy, and the Convotherm oven accomplishes this task automatically with just the touch of a button. 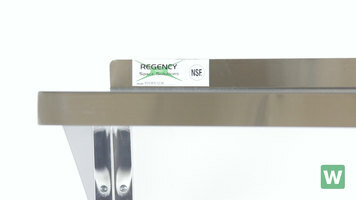 Finding enough storage space in your commercial kitchen can be difficult, so adding NSF Listed Regency wall mount shelves may be just the solution! 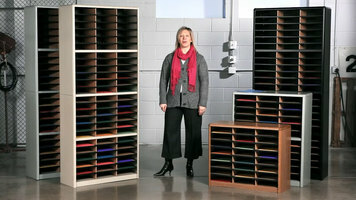 Check out this video to learn all about our Regency shelves and expand your storage capabilities!